Are you like me when you taste good food, that first bite, your brain says "hmmm I wonder how this would be if x and x were added?" That's exactly what I did when I made my NY Style Pumpkin Crumb Cake--I instantly thought, 'I should add a hint of butterscotch next time'. Pumpkin and butterscotch a no-brainer right? 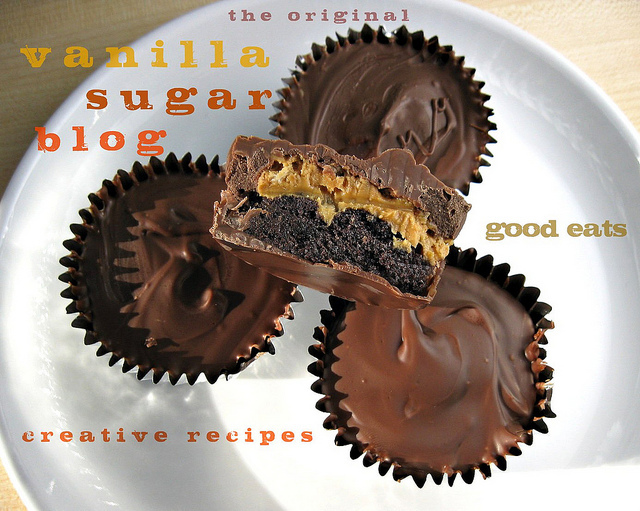 Well, as long as the butterscotch is toned down a bit--too much is just wrong and tastes all chemically. This actually would be perfect for a Thanksgiving breakfast. It's quick and easy to throw together. 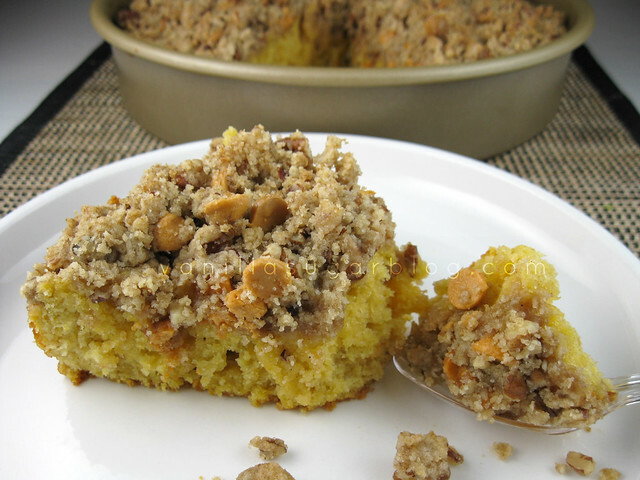 And if you're a crumb-junkie (like me) then you'll love this. Plus it's a bit lighter than the NY style crumb cake. It makes a lot of crumb--but this is good. If by chance it is too much crumb for you, freeze half for another cake! Is it wrong that I wanted to eat it raw? I mean doesn't that look good? Sift flour, baking powder, and spices into a bowl; add in the sugar and mix. In a separate bowl whisk greek yogurt, eggs, pumpkin, and oil together. Stir in the dry ingredients until just combined. Lumps are good, do not overmix. Spread batter into 9 or 10 inch cake pan. 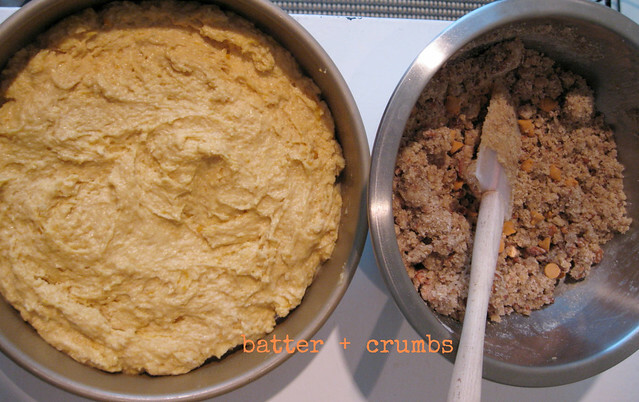 Make the crumb mixture by combining all ingredients in a bowl, mix well, and then add in the butter; mix. 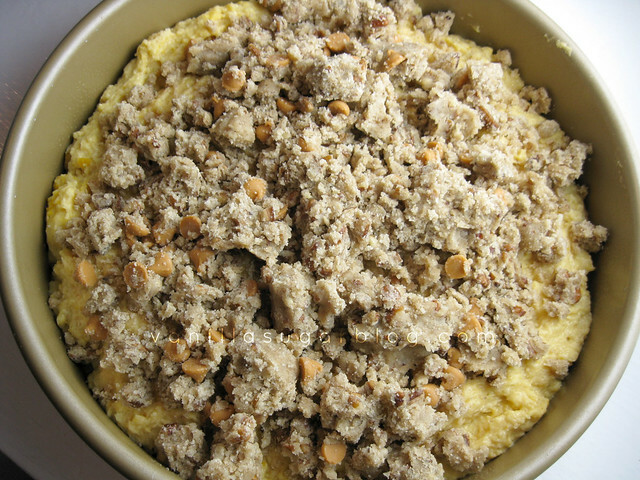 Using your hand, make medium clumps and place on top of cake batter. Please let this set up and cool at least an hour before slicing. You could try using this batter in muffin tins. Just reduce and/or watch the baking times. I love the butterscotch + pumpkin combo. What a great idea to add chips to the topping on this! You are the queen of crumb cakes! I recently made one and ever since have been really paying attention to how many you have - and I want to try them all! Love that this one is baked in a 9-inch pan. 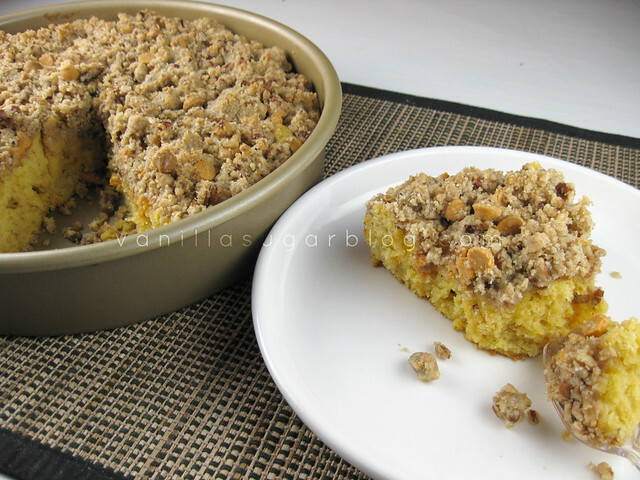 I love crumble topping and butterscotch, too! 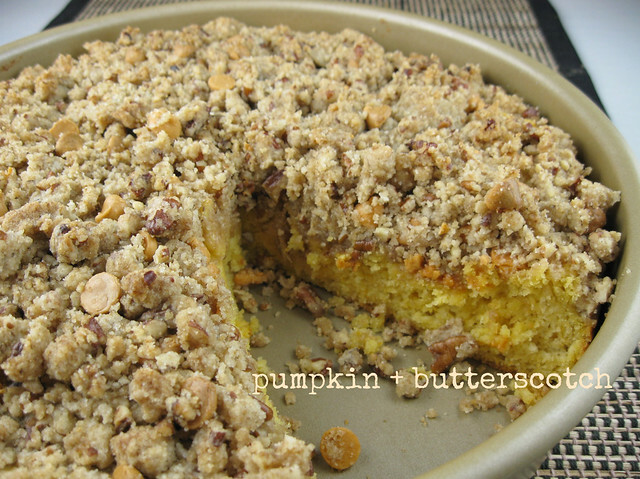 I totally agree that pumpkin and butterscotch were meant for each other! And for large crumbs. LOVE IT. 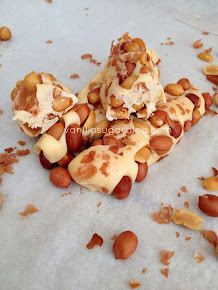 I've never tried pumpkin and butterscotch but I bet it's great! I am finding myself saying people can freeze crumble if it's too much because in my book there can never be enough crumble. Girl, are you pumpkined out yet? 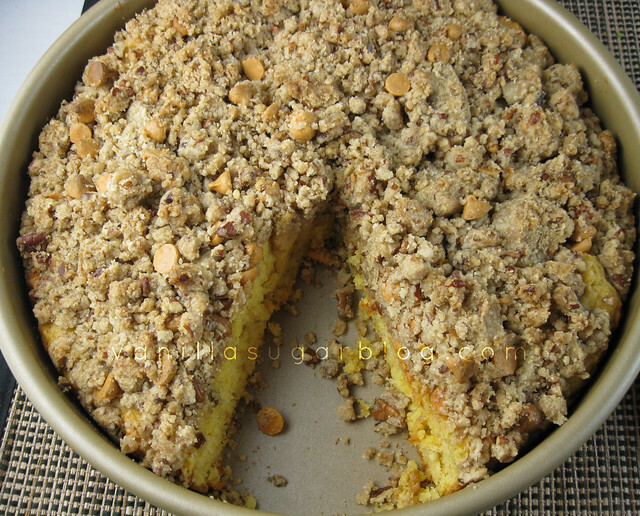 crumb is good, and love the butterscotch addition :) i'd cut myself a big slice! When I first started blogging, I was drawn immediately to one of your crumb cakes because the crumb was so generous! Honestly, I think you make the best looking crumb cakes. Ever!